Editor's note: This is the fourth of a series by Brian Johnston about having a custom guitar made. The first three articles looked at how and why Brian chose luthier Stephen Casper to build his instrument, along with detailing how they made design s decisions. This week's installment further explores equipment selection and philosophy. Links to the first three articles appear at the bottom of this article. A week later and Stephen has completed the routing, shaping and initial contouring. It is at this point that he attaches the neck and ‘handles’ it for a bit... to get a sense to see if more material needs to be removed in order to give it the feel he’s looking for on the body. 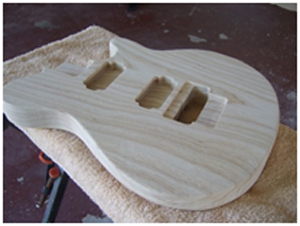 Sometime next week he will be wrapping up on the neck details, to the point whereby he can fit it to the body more precisely in order to finish the body contouring at the neck joint; this is where his neck-body fit is better than most and why his guitars have a reputation for great sustain. Stephen also has sourced out most of the hardware materials, based on our past communications, and he’ll be ordering most of it shortly. In regard to pickups, we have decided on the DiMarzio Mo’ Joe split humbucker for the neck position, the same pickup in my Ibanez JS2400, the model currently used by Joe Satriani and his Black Swans and Wormhole Wizards tour. I really like this pickup, and its choice was obvious to me. There is no woodworking required when installing the E-Tuner with most (mass produced) guitars, but Stephen is hand-crafting a very low profile guitar with the pickups recessed accordingly. Now with this new tuning device surrounding the bridge pickup, he needs to fit a humbucker ring around the neck pickup for cosmetic/aesthetic purposes and he must then fine-tune the routing as need be – as opposed to the original wood-mount he had planned for the pickups to accommodate the contour I wanted for the neck initially (customers are always changing their minds throughout the life of a project, and luthiers must have a lot of patience!). He will be installing the ‘tremolo’ version of the E-Tuner pickup ring as it is only a few millimetres high and is designed for low-profile guitars. Black rings will be used to match the pickup color (black), and Stephen will work with this device to make sure it remains functional and the pickups unobtrusive – a truly one-of-a-kind guitar during every step of the process.